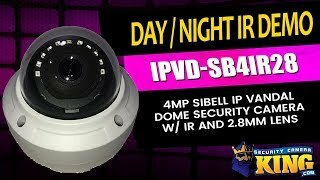 This is our newest Sibell vandal dome camera. This camera delivers stunning 4MP video that can make the difference between mediocre, pixelated video and clear, detailed video that the police can use if you should ever become the victim of a crime. With a 2.8mm fixed lens, you’ll have a camera that will work in a variety of situations ranging from large parking lots or warehouses to your back yard and even smaller areas like a small retail store or over a cash register. With an IP66 rating, you can feel comfortable using this inside and out and in various types of weather. This is also rated IK10 which means that it is rated as vandal proof and offers you extra protection against damage being done to it. With built-in IR, you can easily set these cameras in areas that have little or no lighting. Often times this will eliminate the need to add lights and/or IR illuminators since the LEDs emit light that allows you to see detail up to 65 feet in the dark. You can also connect a microphone using the audio input that will enable you to not only see but to hear what’s going on. There's no need to be concerned if your power supply is not nearby! This camera is capable of being powered with not only a standard 12v DC power supply but you can also hook this up to a PoE switch or your PoE capable NVR. This can make it much easier to install these and many other IP cameras because you will already need to have CAT5/6 cable available to transmit the data. Why bother having to run a power cable when you can use that same network cable? Don’t forget about the extras that are included at no additional charge. We include a 2 year warranty, FREE US based tech support and FREE remote monitoring software! All of our Security Equipment comes with FREE remote viewing Software & apps for your PC, Mac or mobile devices.